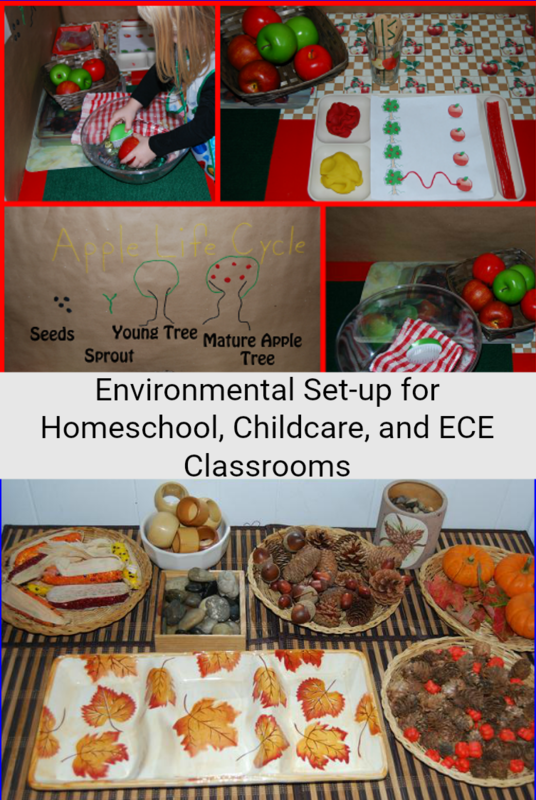 I have the privilege of blogging today with a wonderful group of homeschoolers, childcare providers, and classroom teachers who are bringing YOU a little environmental inspiration! Others always ask what curriculum and philosophy we use at home. 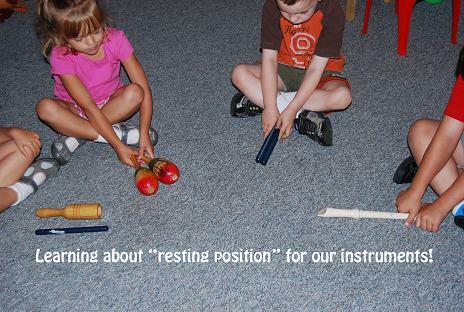 My answer is that we use LOTS of inspiration and playful learning activities. Just as I think it takes a community to raise successful children, it takes a “tribe” of playful learning activities to teach children well. In our classroom, we present materials with Montessori, Reggio, and Waldorf inspirations as well as theme-based learning activities. If you teach at home or in the classroom, we hope that you might find something that your own kids will like as you browse through the different classrooms and home environments! I have taught children at home for the past 33 years. 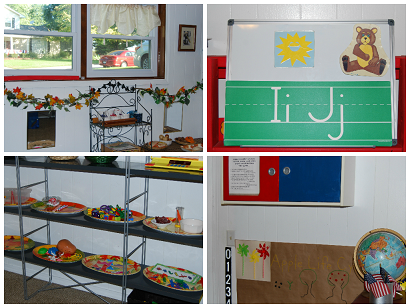 I own a private group licensed childcare home/preschool that serves children ages infant to age 6. We operate 49 weeks out of the year and are open from 700 am to 430 pm M-F. 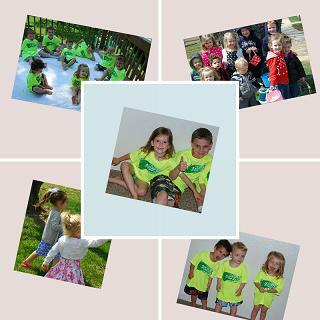 This year, our classroom group of children range in age from 2-5. 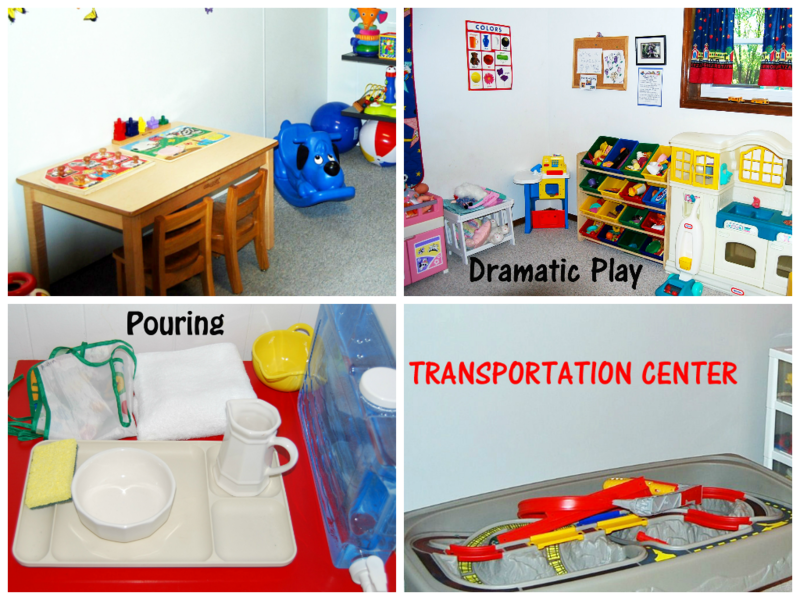 We hope you enjoy a partial tour of our own setting and a little glimpse of what our kids do each day! 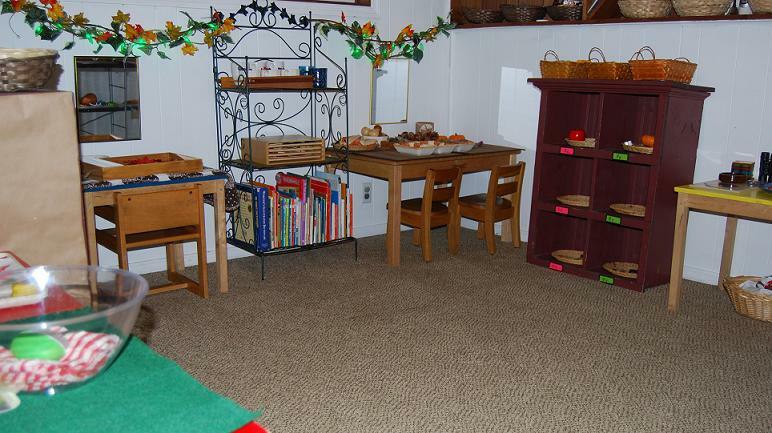 This is a limited view of our home preschool classroom from the doorway. 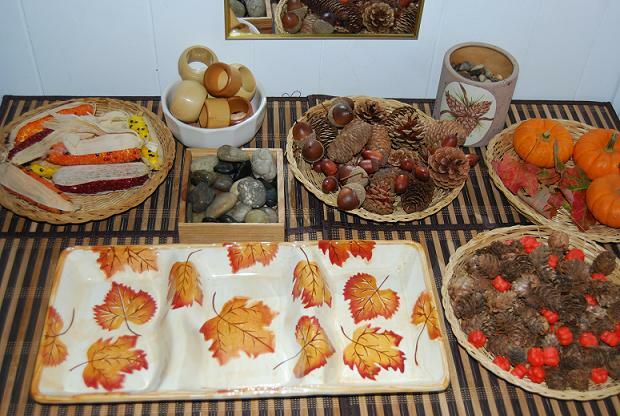 Nature Sorting – this table changes every week (sometimes every other week). Currently, our kids are sorting nature items by size: small, medium, and large. 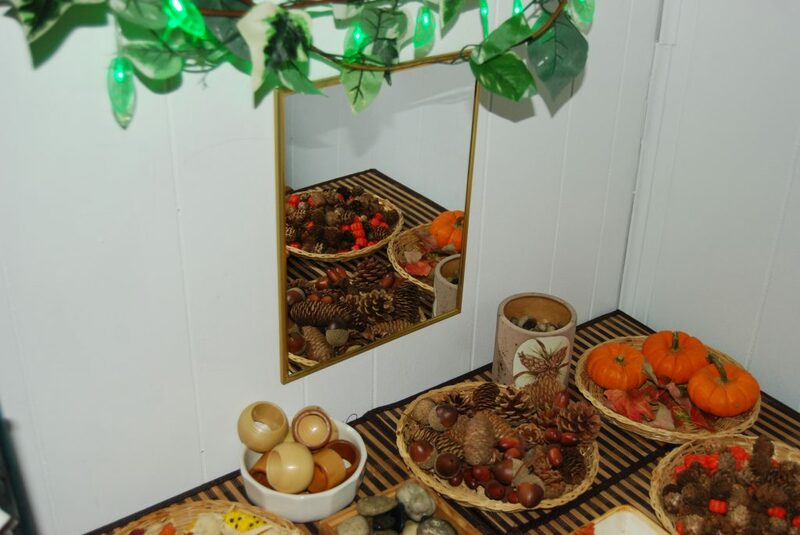 Mirrors are great for learning; our kids love looking as we play! The kids sort the items by hand or with various transfer tools. Learning and set up doesn’t have to be expensive. The leaf-themed sorting tray was a Goodwill bargain at $2.99. It’s perfect for sorting small, medium, and large nature objects! 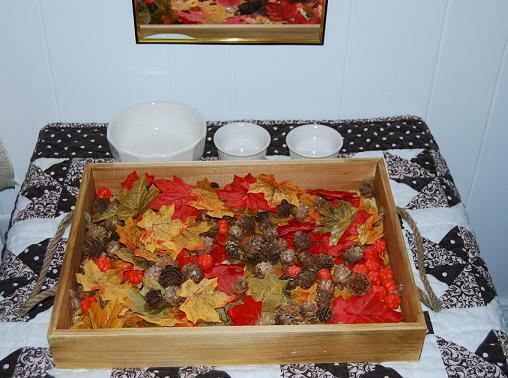 Another sensory size sorting tray: the kids use tweezers or tongs to transfer (and sort by size) the leaves, pine cones, and miniature pumpkins to the containers. Practical Life/Cross-over Activities (Pre-Writing/Science): Our practical life skills table changes weekly. This week our kids are washing, drying, and shining apples. Our kids will also do apple coring and serving, washcloth folding, and peanut cracking/making peanut butter throughout mid-October (we have no children will allergies this year)! We often use cross-over activities at the same center/wall due to space limitations. 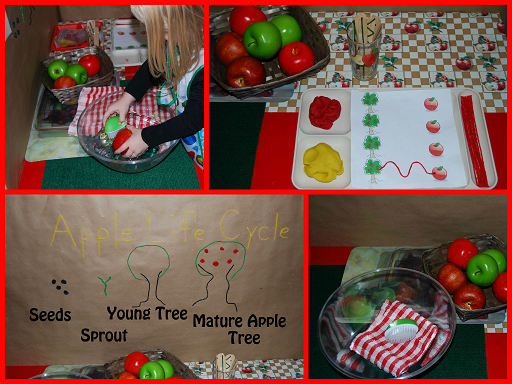 Currently, we have Apple Life Cycle creations and an Apple Scented Playdough/Wikki Stix Pre-Writing Tray. 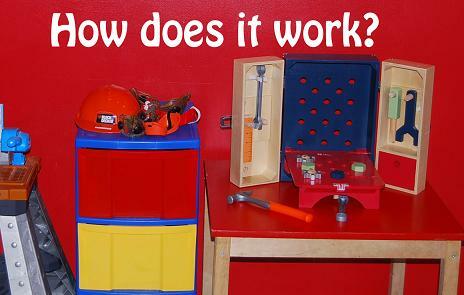 For more ways to use Practical Life in the classroom or at home to encourage developing skills and independence, see here. Alphabet Shelf: We do not introduce letters in alphabetical order. Each week our kids hunt the classroom, magazines, and outside play areas for items that begin with any of our six focus letters. We add to our trays daily (where possible) to enhance letter recognition and beginning sounds. We accompany any letter introductions with various thematic literacy activities. Since our kids are together from the time they are infants, we have many opportunities to explore literacy, letters, sounds, and beginning words. 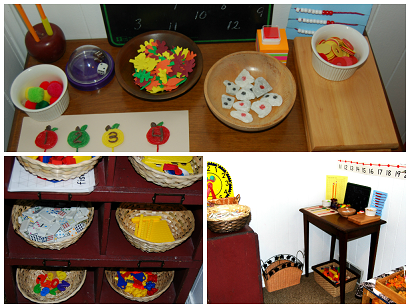 Maths: Our math center and shelves have a variety of manipulatives to cover a wide-range of objectives. The baskets and table games change frequently as the children gain skills throughout our year. We have mixed ages in our classroom and the kids learn alongside each other everyday. 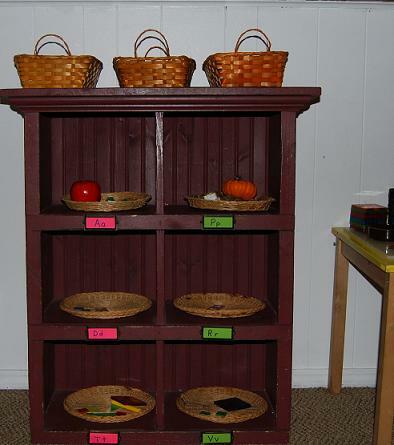 For ways to encourage intuitive math in preschool, see here. 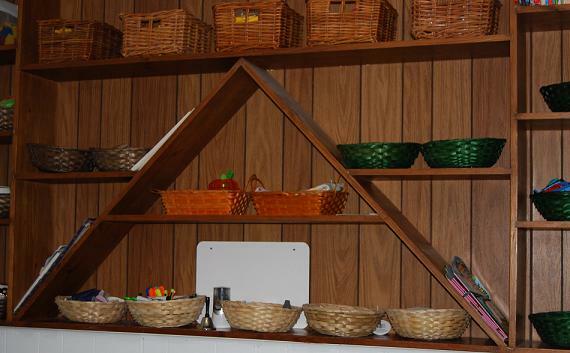 Learning Trays: We have 4 shelves that house our activity trays. Our kids know which tray requires a table or can be done on the floor. The trays consist of many fine motor activities at the beginning of the year. Later, our activity trays will contain literacy, writing (pre-writing/stamping), math, science, and other seasonal thematic activities for explorations and playful learning. You might also like activities to teach and encourage developing scissor skills – see here for suggestions as kids gain confidence and fine motor skills. Documentation: We have several inexpensive cameras in our home classroom. 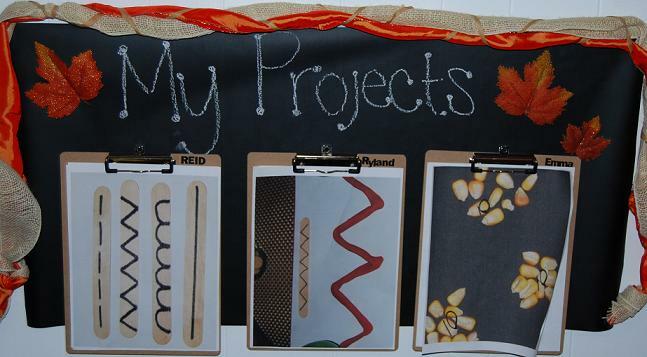 Our preschoolers take pictures of their learning and projects then post to their own clipboards in various display locations. It’s a fun way to integrate technology and allow them to own their learning documentation. If you ask our kids, the outdoor play center is one of their favorite activities! 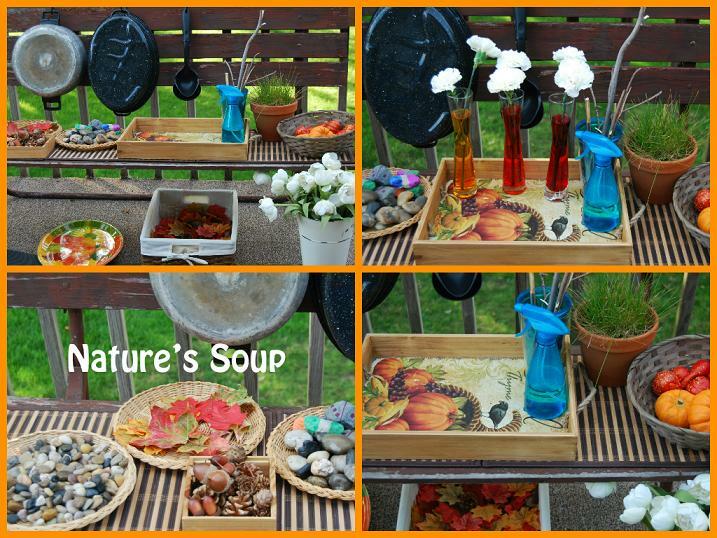 We are “cooking” nature soup this week and beginning a carnation coloring experiment! As the weather gets colder, we’ll make scarecrows/pumpkin stew and have ice/snow explorations (amongst other creative play ideas that only our kids could imagine)! All of our kids come together in a common area at various times throughout our day to paint, read, sing, dance, practice fingerplays, play games, and explore instruments! Some years are better than others for organization. I’ve planned to paint storage shelves in our preschool classroom for the past month. They are STILL ugly, but I LOVE the storage space! I did get all of September’s monthly activities sorted into baskets, but obviously didn’t bother to DUST the shelves as well as I thought I had! :) I thought about re-taking the photo, but this is real. Sometimes DUSTING just doesn’t make our to-do list. That’s OK…we accomplish MANY things during our days! Thanks for sharing a little of our home learning environment with us! Playing to learn is FUN when you have special friends to share it with! I just love your setup, Darla!! How homey and inviting. I’m so glad you shared the beautiful outdoor nature center too. Thank you for opening your home and sharing it with us all. Katie – thank YOU for all of your coordinating efforts! I want to come play in your greenhouse! 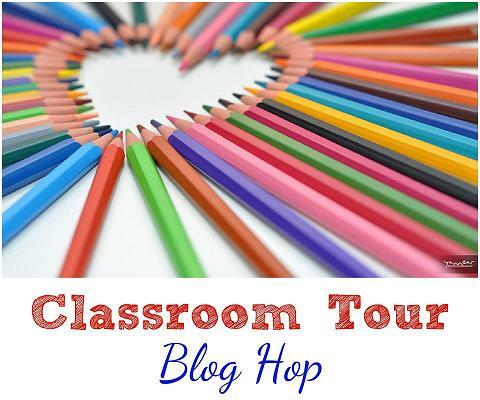 :) Love this blog hop and ALL of the inspiring ideas! Wow! I love the baker’s rack….. and your dusty shelves look great in the natural color!!! Thanks for sharing your space! AMY, thanks so much for visiting AND your comments! The shelves are fine..for now. :) I just saw your post; wish we lived closer together! Lisa – well:)some of the photos were taken after childcare was done for the day. For the most part, I have great little helpers. We make HUGE messes, but they all have “jobs” and daily tasks. Without them, we couldn’t keep anything tidy. :) Thanks so much for visiting AND your comment! So many wonderful ideas in this space! You have such a great space for learning. I love how organized you are with you trays and opportunities for independent learning. Thank you for letting me into your home!